Hurrian cannot be considered an Indo-European language — this is so obvious that it barely needs to be stated. Traditional Indo-European languages, such as Sanskrit, Greek, Latin, Gothic, Old Irish, Old Church Slavic, Tocharian, etc., are clearly related to each other through many common features and shared innovations that are lacking in Hurrian. However, that is not the end of the argument. In the preceding chapters, we presented evidence that Hurrian and Proto-Indo-European “[bear] a stronger affinity, both in the roots of verbs and in the forms of grammar, than could have been produced by accident; so strong that no philologer could examine [them] without believing them to have sprung from some common source.” In this chapter, we will discuss our views on what that common source may have been like. In so doing, we will have to delve deeply into prehistory, well beyond the horizon of what is traditionally reconstructed for Proto-Indo-European in the traditional handbooks. Our discussion now comes to an end. In the course of this book, we have attempted to show, through a careful analysis of the relevant phonological, morphological, and lexical data, that Urarto-Hurrian and Indo-European are, in fact, genetically related at a very deep level, as we indicated at the beginning of this chapter by quoting from the famous Third Anniversary Discourse (1786) of Sir William Jones. We propose that both are descended from a common ancestor, which may be called “Proto-Asianic”, to revive an old, but not forgotten, term. On the basis of genetic data I have recently proposed an origin of the Indo-Aryans in the Transcaucasus, based on their possession of a genetic component related to that of modern Northeast Caucasian speakers and the putative relationship of the latter with the Hurro-Urartian group. If the Hurrian-Indo-European "Proto-Asianic" hypothesis is true, then it would strengthen that hypothesis as it would place the Proto-Indo-Europeans in the vicinity of the Hurrians. A. Kassian. Hattic as a Sino-Caucasian language // Ugarit-Forschungen. Internationales Jahrbuch für die Altertumskunde Syrien-Palästinas. Bd 41, 2009–2010. P.309–447. where he makes some historical speculations. As I said, I leave the linguistic arguments to the experts. I'll just add that the concept of a Sino-Caucasian language family rubs me the wrong way in every way possible. I don't know what arguments are made for it, but I don't see a shred of genetic evidence that would parallel such a language family. That book is about Indo-European elements in Hurrian not Hurrian being-strongly-(as all world languages are related at a out of africa primeval language level) related to IE, and this is in line with a western asian homeland for proto indo-european and when Hurrian tribes migarated from the caucasus to western asia (the homeland of proto indo-hittite) they did absorb many IE elements and IE elements in Hurrian is a FACT accepeted by the mainstream scholars! However Hurrian and proto indo-european differs greatly at a structural level, while pie is an inflective ablautic language hurrian is an agglutinative one. Thus the proto Indo-European elements in Hurrian are very interesting. It should be noticed that there are also an Indo-European superstratum (from the Indo-Iranian branch=>Mitanni) into Hurrian as well. We could perhaps compare the "para-proto indo-european" substratum in Hurrian with east Iranic elements in Turkish and the indo-iranian mitanni superstratum in Hurrian with west Iranic (Persian) elements in Turkish at a purely taxonomic oriented level comparison between Hurrian and Turkish. I seriously doubt the theorized relationship between Proto-Indo-European and Hurrian is substantial. Maybe be due to areal influences rather than genetic ones. Hurro-Urartian bares a much more striking resemblance to the Northeast Caucasian Languages...Nakh-Dagestani. However, I do believe that Indo-European speakers existed near or in the same area as the Caucasian Languages for a long period as is evidenced by Indo-European loans or borrowings in the Caucasian languages, both North Caucasian and South Caucasian. I'm not an adherent of a common human protolanguage (not even Sino-Caucasian one), but Kassian's paper presents some evidence for linguistic, archaeological and anthropological connections between Balkans and North Caucasus relevant to you post. (Kassian, 2009). The second probable candidate is Narrow IE *tar-os ‘aurochs’ < Sem. either are chance coincidences or represent the common Nostratic–Afro-Asiatic heritage”(page 426). All those linguists are saying is that there are I.E elements in Hurrian, not that Hurrian is I.E. There are Semitic elements in I.E and I.E elements in Semitic languages. Language borrowings is not unusual. No offense to linguistics but Linguistics is all smoke and mirrors. I read both the book, Kassian's review, Fournet&Bomhard's answer to the review as well as Kassian's answer to Fournet&Bomhard's answer. As for IE homeland, besides loanwords it's the fauna and fluara described by PIE as well as the absence of north european component amongst indo-european speaking armenians, anatolians[before language shift],iranians and indians (while western asian component is present in all indo-european folks of europe) wich are against an ukrainian homeland of early proto indo-hittite. What makes this attractive, or in general the northwest Balkans to roughly Hungary and surrounding low lands,is that this area is the home of the people who prevented agriculture to spread north for 500 years, but then may have been instrumental in bringing about the Danubian (after creating grains and animals and practices suitable for the colder, longer winters and generally wetter climate). Also, one can interpret the early northern agriculturalists' mtDNA such that it was of local origin, from this region. IE could have entered the Ukraine via Poland and along the rivers going south (there is some evidence for the establishment of Danubian-style houses migrating exactly that way) - rather than moving west from the Ukraine. The likelihood of unusually heavy linguistic borrowing in Hurrian under pressure from both an Indo-Aryan Mittani superstrate and a Hittite areal influence seems more plausible than a deep common origin for the two languages that is stronger than other Eurasian languages (although, of course, if you go back far enough, presumably all Eurasian languages have a common origin at some point). A good analogy might be the way that Latin grammar and verb roots made their way into the Germanic substratum of English in the Middle Ages (particularly in the kind of formal official writings that survive to us today to provide what we know of Hurrian) under the influence of Latin language using Catholic officials and French language speaking rulers. Thus, English has far strong similarities to the Romance languages than would be expected from the common Indo-European origins of the Romance, Celtic and Germanic languages. "On the basis of genetic data I have recently proposed an origin of the Indo-Aryans in the Transcaucasus, based on their possession of a genetic component related to that of modern Northeast Caucasian speakers and the putative relationship of the latter with the Hurro-Urartian group." I certainly give credence to the Northeast Caucasian relationship to Hurro-Urartian. The linguistic similarities are strong, the geography is right, and given what we know about history, geography and population genetics the Northeast Caucasian populations are plausible populations in the region to be the oldest layer and to have escaped the Indo-Iranian wave from Persian, the Hittite wave in Anataolia and the Akkadian influence from Mesopotamia into adjacent mountains, that between these three pincers, exterminated other Hurro-Uratian languages and Kassite and Elamite languages as well. But, the presence of this population genetic component in Indo-Aryan has other possible explanations. Given the very old layers of advanced metalworking in the Transcaucus, and the close coincidence of advanced metalworking in South Asia with the Indo-Aryans arrival that is similar to that of the methods used in the Transcaucus, one possibility that seems plausible is that metalworkers from the Transcaucus were incorporated as a jati-like group into the Indo-Aryan population wave, a bit like the way that diasporic Jews were the bears of certain professions in Europe as a distinct population within a larger society there. I am also inclined to think that the cult of Hephaestus/Vulcan in the Mediterrean (and perhaps that of Viśvákarma in South Asia) may have been a late fusion to the Indo-European pagan pantheon with an origin in the Caucusian/Hurrian peoples, as the center of his cult in Lemnos was one of the longest holdouts of non-Indo-European languages in the region. In contrast, in the East, this cult may have been an integrated part of the Indo-Aryan ethos by the time it arrived. It is also plausible that the genetic profile of the Northeast Caucasian speakers today may have been extant over a larger range ca. 4500 BCE, i.e. pre-Mittani and pre-Akkadian and pre-Hittite. 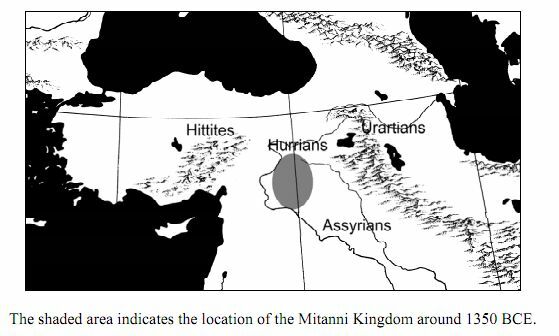 The factors that allowed them to keep a relative of a Hurrian language today may also have made their genetic traces unmuddied by the many waves of migration that have impacted population genetics to some extent in neighoring areas. Thus, even if East Anatolia does not have population genetics that look like the NE Caucasians today, that doesn't mean that the Hurrians might not have looked similar in population genetics to today's NE Caucasians at the time when Indo-Aryan ethnogenesis was taking place. So, one doesn't need admixture to take place precisely in the NE Transcaucus for the hypothesis to be plausible. The archeologist Goodenough too, proposes the Balkan region as the homeland of proto indo-european. Also autosomally speaking, indo-european speaking Armenians appeared to be lacking the north european component but have the western asian one, so perhaps western asian component is connected with indo-hittite and its "daughter-component" (most closest one according to mr Dienekes's project) is connected with indo-european proper. Some users on other fora, saw that proposal as a result of "asiocentrism" however there is no any "centrism" when investigating relations between languages or searching the region where the proto language first developped before its breakup! And all languages do descend (or are related) from a single language of the first modern human to migrate out of Africa. "IE could have entered the Ukraine via Poland and along the rivers going south (there is some evidence for the establishment of Danubian-style houses migrating exactly that way) - rather than moving west from the Ukraine." Your first two "flaws" assume neolithic time scales for R1a and R1b etc. in Europe - which I and many, many others find ridiculous given the star-like patterns within Europe that equal those outside in depth and age, and because the existing pattern is not supported at all by the known archaeological, well-established migration findings. As to typical IE words, the many lakes and rivers and mountains in and around the Carpathian basin, and its varied climate and landscape, are actually a good match. As to the agricultural vocabulary - sure, some of it likely came from Anatolia, where the agriculturalists moving into the Balkans originated. How much of that vocabulary can easily survive 9,000 years is another question. There seems to be a tacit assumption that OOA dictates a monogensis of language.This is part of a greater desire to have the whole OOA experience happening once. once the physiology was in place multigenisis is hard to rule out. And as there increase in the number of possible routes out of Africa, there is an increasing possibility that there were multiple groups who broke out of Africa. This increases the chance that languages of different origins mirated out also. The thing is Arnaud Fournet is an amateur linguist fond of crackpot theories, Hurrian being one ihis favourites pastimes. But now Bomhard has retracted from this coauthored work. Megalocomparativism is a great fail. It fails everywhere and always. People who are engaged in it just have very dim imagination of what languages are and how they should be compared. Personally I clearly assert that Hurrian is an Indo-European language, being even clearer in that respect than Hittite. I must add that Bomhard indeed was rather colder than I was as regards the level of relationship between Hurrian and PIE. He thought the relationship is distant whereas I think that it is so close as to mean Hurrian is basically an IE language. Note that Hurro-Urartean is also close to Nakh, which does not disprove the relationship with IE languages. And thus you made a fool of himself, my dear Arnaud.